WEST VILLAGE — New York City has more than its share of characters, but according to one actress and writer in the West Village, there's one community that is due for a ribbing. Now in its second season, Smith’s series follows her fictional alter ego, Saige Winters, as she uses her clairvoyant skills to help everyone from a sexually stunted 20-something man to a duck with mood issues. Shot in a reality show format, the mockumentary has highlighted not only Smith’s neighborhood, but many people she’s met on New York City streets. “I’ve had a love-hate relationship with New York. I’m 100 percent totally in love with New York since this show. There are characters here like nowhere else,” she said. Smith recalled finding a man in James J. Walker Park to play a guest-starring role in her show. “He was really excited because he said, ‘I always wanted to be a movie star.' I don’t know if this guy was homeless. I think he might have just been a guy on the street. I’m actually still looking for him but he did a great job,” she said. Smith also filmed a neighborhood character whose unorthodox name for himself — "the 6-foot-7 Jew" — immediately caught her attention. “First I saw him in the West Village — I mean, you can’t miss this guy. Then when I saw him in the East Village, I’m like, that’s a sign, I have to have this guy in the show,” she said. Smith has shot most of the self-funded series in the West Village, the East Village and Park Slope, using a two-person crew, who are paid out of the tiny budget. Actors perform for their own personal amusement, as many are personal friends. The five-to-10-minute episodes feature a wide variety of New Yorkers coming to Saige Winters for help with their issues while Winters struggles with her own issues with her therapist, who does not believe she has clairvoyant powers. Smith does not claim to be a full-on psychic herself, but she does say everyone is a little bit psychic. Smith's inspiration for the series came after time spent studying to be a reiki practitioner. “I was around all different kinds of healers: kinesiologists, astrologers. I have great reverence for astrology. So that’s also why I know a lot of the jargon because I’m really trying to teach something here,” she said. 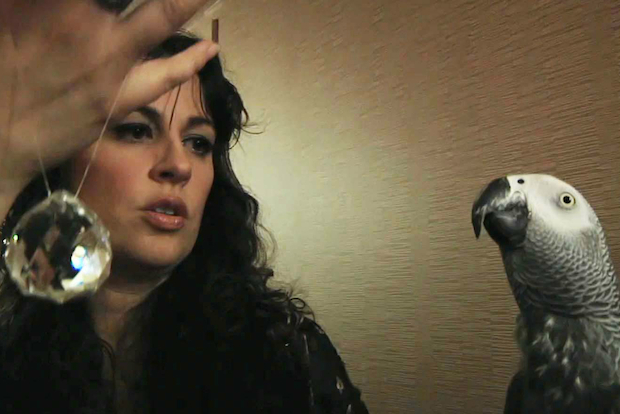 Smith’s character is by turns an animal psychic and a life coach for lost souls. “The thing about Saige is that she sees all these other psychics who have reality shows, so she starts to make her own reality show. I’m playing with narcissism, but she also means well and wants to help people,” Smith said. “I want people to laugh, that’s the main thing. I think we should all be able to laugh at ourselves,” she said. New episodes of “Saige Winters: My Psychic Life” go live every Thursday.